Freeze-drying of samples (lyophilization) is routinely used to preserve integrity of samples and extend a sample’s shelf life. Some common examples are milk or coffee powder, protein powder used for human and animal consumption, thousands of common biological samples. However, lyophilization is not well-suited for small samples (10 ul or 100 ul) or complex specimens such as blood. The use of filter paper or other similar products to collect blood samples and subsequent air drying or so called DBS (dried blood spot) is a simulation of lyophilization process and well-suited for small samples. DBS or filter paper sampling has been in use for decades for the assessment of the health status of human neonates for congenital defects such as phenylketonuria and DNA based testing. ADI’s TruStrip™ STS is the smart enhancement of time-tested technique of sample collection but designed for protein, antibody-based testing. Anatomy of a TruStrip™ strip. What makes TruStrip™ STS “novel, smart, efficient, and tamper-proof”? The TruStrip™ strips are designed to absorb defined volume of sample without the use of a pipette, have sample ID tracking system (manual or barcode), clearly show the sample species (human, mouse, rat etc) color tags, and have sample tracking dye (STD) to indicate if TruStrip™ strips have been used (tamper-proof) and if the sample has been fully recovered. TruStrip™ strip sample capacity is clearly marked on the strip to avoid any confusion. Each TruStrip™ strip sample pad has its own “sample cover pad” to protect the sample. TruStrip™ strips are designed to be efficient and high-throughput and thousands of samples can be stored or transported in just 1-2 sq. ft. of space. All of these features make TruStrip™ STS “novel, smart, efficient, and tamper-proof”. What is the sample load capacity / volume of TruStrip™ strips? TruStrip™ strips are designed to hold 5, 10, 15, 25, 50, 100, 200, and 400 ul of sample volume. Samples up to 50 ul can be accommodated on 5 x 80 mm strips; 100 ul, 200 ul and 400 ul strips have 10 x 80 mm size. Of course the strips will take a defined volume when a fixed volume of sample is loaded. The capacity of size of TruStrip™ strip is defined by its ability to absorb or wick the defined volume of sample (whole blood or saline or water) within 30 seconds. All of the TruStrip™ strips sizes are “TRUE” to within 2-4% of indicted capacity. It is possible to create custom sizes if necessary. Each strip is made up of an inert, non-porous support that has an “active sample pad” of varying size at one of the strip. TruStrip™ strip has other smart, tamper-proof sample tracking features. How are samples transferred or stored on TruStrip™ strips? TruStrip™ strips are designed for ease of use, storage, transport and downstream recovery and processing of samples. Defined volumes (5, 10, 15, 25, 50, 100, 200, and 400 ul) of liquid samples can be transferred to the TruStrip™ strip “sample pad” simply by wicking or contacting the sample for 10-15 seconds, or loaded on to the sample pad by transfer pipette or volumetric pipette. The sample pad has a sample pad cover that flips over the sample pad to protect the samples. TruStrip™ strips containing samples are dried at room temperature (15 min-60 min depending upon the sample type and volume) or dried at 37oC incubator to enhance evaporation or drying. Each strip can be assigned a sample name or ID by hand writing it or with a barcode tag affixed on the backside of the strip. TruStrip™ strip with samples are then stored in the specially designed tray for storage or transport. Storage options for 1 or 5 strips are available. How much time does it take to transfer 100 ul of a sample to the strip? High-protein, viscous and high-density samples take about 5 seconds to transfer up to 400 ul sample by wicking. We recommend allowing 10-15 seconds to assure complete saturation of the strips. The strip will not absorb more than its designed capacity even if wicked longer. Is it possible to transfer more sample than the designated volume? One of the smart features of the TruStrip™ strips is its ability to absorb only the designated volume of sample (e.g., 100 ul) by wicking in 5-15 seconds. However, it is possible to manually load more than 100 ul when adding samples with a pipette. Excess amounts may spill over the sample pad. We recommend not exceeding the designated sample capacity of the TruStrip™ strip. We have TruStrip™ strips available in appropriates sizes (5, 10, 15, 25, 50, 100, 200, and 400 ul). How are samples recovered from TruStrip™ strips? TruStrip™ strip sample pads exhibit minimal proteins or antibodies or DNA binding. The pads are non-cellulose and are chemically resistant. Sample pads hold samples within defined interwoven, pore structure. Samples are protected with “sample cover pad” that can be easily detached. The sample pad is then either cut-off from the strip or the whole strip with the sample pad is immersed in a desired sample recovery solution (water, saline, buffers or solvents). For full quantitative recovery, it takes 3-5 volumes of the sample load (e.g., 50 ul sample will need about 150-250 ul of recovery solution for 95-100% recovery). For non-quantitative recovery, samples can be recovered with less volume. The sample pad is incubated with intermittent manual shaking or vortexing for 15-20 min at room temperature. Any common 1-2 ml Eppendorf tubes, vials, 96-well trays, or 2 ml tubes can be used for high-throughput sample processing. Samples removed from strips with sample tracking dye (STD) will have slightly pinkish coloration (or other known colors) due to the dye. High protein and colored samples such as whole blood will have less visibility of the dye but the STD can still be tracked spectrophotometrically using a specific wavelength. Normal plasma or serum samples will allow easier tracking of the dye. What is the average sample recovery time? We recommend immersing the sample pad in the recovery solution or buffer for at least 15-20 min for full recovery. For convenience, TruStrip™ strip can be kept in the recovery solution for longer periods at room temp or 4oC or even overnight. How is TruStrip™ strip stored and transported? TruStrip™ strip with dried samples and the containers are stored either at room temperature, 4°C or frozen depending upon the nature of the sample. Most biological samples (blood, plasma, urine, purified proteins, antibodies or chemicals or drugs) are very stable in dried state. The TruStrip™ trays can be shipped at ambient temperature without any special regulations or concerns. TruStrip™ trays are stackable for easy storage. Thousands of samples stored in TruStrip™ trays can be stacked and stored in a space of <1 sq. ft.
Is it possible to store more than one TruStrip strip in the same chamber of the storage tray? TruStrip™ storage trays are designed to hold each sample in its dedicated space to avoid any chances of sample contamination. The individual trays have a depth of 0.6 cm that can hold 3-5 strips in a single tray. That makes it possible to store multiple replicas of a sample in the same cavity. Users have to decide if this creates any issues in testing. How to order TruStrip™ STS? It is necessary to have the following information before deciding to select the TruStrip size. Need to know whether the sample tracking dye is needed or not. Species (mouse, rat, human, monkey, bovine pig, rabbit or goat). The strips will have species tag on them to minimize sample error and unique identification. There is no separate cat# for species so it should be mentioned when ordering. ADI also offer a white tag (for no species and users can write the species on it). Ordering information for TruStrip™ storage and transport tray. Ordering TruStrip™ STS in bulk packs. ADI is currently offering all strips in user friendly and economical 50 strips per pack. We can custom pack in quantities of 1000 strips to make the pricing more attractive. What is the function of “Sample Tracking Dye” in TruStrip™ strips? One of the most important features of TruStrip™ strips is the use of Sample Tracking Dyes (STD). ADI has developed and selected proprietary dyes with absorption in the visible spectrum to provide a clear visual indicator and serve as a signal for “sample-on and sample-off”. The dyes can be detected even in complex samples such as whole blood for absorption at a given wavelength. Other samples such as normal serum or plasma (without significant hemolysis) can be visually colored when recovered. Dye on TruStrip™ strip is striped as a colored line at the distal end of the sample pad. When samples are wicked or pipetted, the dye line diffuses to indicate that the strip has received a solution even if sample is colorless (sample-on indicator). An accidental exposure of TruStrip™ strip to any solution or intentional tampering will be evident as well. When samples are recovered from the TruStrip™ strip, the dye will diffuse out into the solution and serve as sample-off indicator. It is even possible to measure the release of the dye or its recovery at the given absorption wavelength to prove full expected recovery of the dye that, in most cases, is a proxy for sample recovery as well. The dyes are non-reactive with proteins, DNA, antibodies and have no known interference. We still recommend the users to determine if the dye presents any issues with their sample analyses. TruStrip™ strips with the dye have +D+D (pink) tag on the strips to indicate the presence of the dye. It is also visible as a line on sample pad. ADI can add customized dyes whose spectral properties or color is only known to us or our clients. This can serve as an added precaution that a given type of samples (human, bovine, monkey etc.) originated from a given company at a given geographical location. This makes this technology a type of “GPS-enabled” sample collection, storage and transfer system. 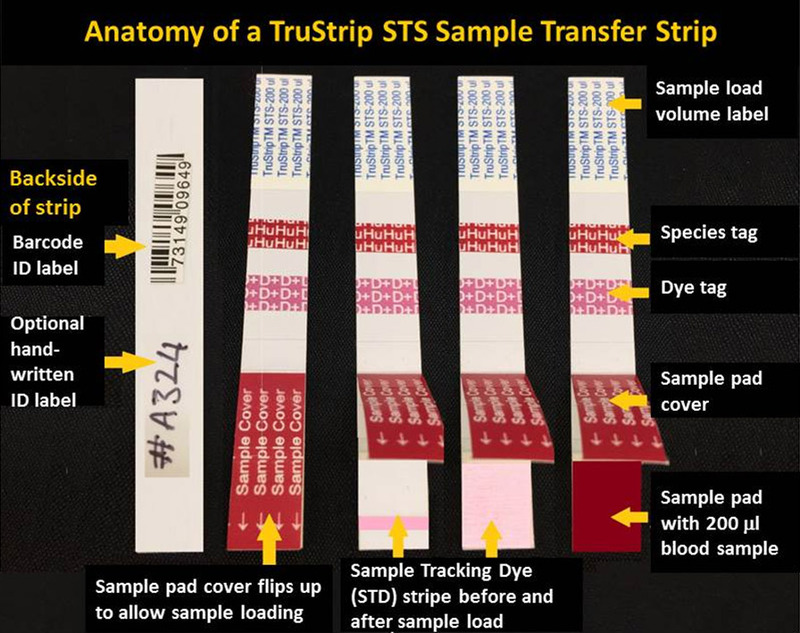 Do sample tracking dyes used in TruStrip™ strips interfere with sample testing? The dyes are non-reactive with proteins, DNA, antibodies and have no known interference. The dyes have been tested for recovery alone or in the presence of known concentrations of purified proteins, antibodies or DNA. Antibody containing samples (Anti-Ebola or Anti-MERS in experimental or human serum or whole blood or simulated samples) yielded the same values with or without the dyes. Antibody testing at 1:100 or higher sample dilution demonstrated minimal trackable concentration of the dye. Is it possible to order TruStrip™ strips without the sample tracking dye, or a different dye? ADI is currently providing TruStrip™ strips with or without the pink color sample tracking dye. TruStrip™ strips with the dye have +D+D (pink) tag on the strips to indicate the presence of the dye. It is also visible on sample pad as a line. ADI has other customized dyes that can be used for special samples or tagging its origin. For example, 100 ul TruStrip™ strip for human samples collected in a given geographical location could have a different dye than similar samples collected at another location. Therefore, TruStrip™ strips can be differentiated based upon tracking dye even if all other sample and strips parameters are the same. This is another example of smart use of tracking dyes. Can I use 100 ul TruStrip™ strip for collecting 50 ul of sample, or vice versa? One of the most important features of the TruStrip™ strips is their ability to collect a “defined volume” of sample without the use of a pipette. The knowledge of sample volume is necessary for determining the concentration of analytes within the sample or the presence or absence of an antibody (e.g., Hepatitis or HIV) at a given sample dilution. However, it is possible to use any size strip for collecting less than the designated volume if knowledge of sample volume or complete recovery of sample is immaterial, such as DNA analyses. It is not recommended to load more sample than the designated volume as it may spill over. TruStrip™ strips are similar to a finite volumetric tube or vessel where less is acceptable but more will spill and crated contamination issues. What is the function of “Species Tags” on TruStrip™ strips? Can I order strips without the tag, or with a custom tag? One of the smart features of TruStrip™ system is to maintain sample safety and integrity and have clear visual sample tags. ADI is offering TruStrip™ strips as blanks (no species tag) or with color-coded, two letter, tags for many species (e.g., Human=Hu; Red; Rat=Rt, Blue etc). The use of species tag can avoid sample mix-ups even when using the same size strip for different species in the same location. It is also possible to add company or location specific additional tags. Please contact ADI if this additional customization is needed. Is it possible to use TruStrip™ strips with ‘Human or Hu” tag for another species or sample type? The function of “species tag” is to offer a convenient visual indicator for the source of the sample being collected on the strip. However, there is no human sample present by default on a TruStrip™ strip with ‘Human tag’. It is possible to use strips with any specific species tag for collecting samples from any other species long as the user clearly makes a note of the species identity of the sample collected on that strip. Is it possible to order TruStrip™ strips for species not listed or mentioned in the catalog? ADI can customize the TruStrip™ strips with user-specified species such as goat, sheep, horse, monkey etc. Please conatct ADI for such customization. What kind of samples are most well suited for TruStrip™ STS? It is very problematic to collect, store, and transport biological specimens such as blood, urine, serum, and plasma. The typical liquid samples collection requiring storage devices such as vials / tubes, multiple process steps, need for cold chain for storage and transport, and shipping regulations (dry ice) makes it very expensive. It may cost significant amounts of money to transport one or few samples with no assurance of the integrity of samples if cold chain is required. Samples can be freeze-dried or lyophilized, but it has its own limitations in equipment, loss of samples, and it is not suited for drying small volume of blood or plasma. Therefore, TruStrip™ strips are best suited for temperature-sensitive biological samples being collected in “field conditions” such as animal houses, farms, and clinics where samples are collected and then transported for testing. TruStrip™ strips have been tested on freshly collected or stored whole blood, plasma, serum, purified proteins, enzymes, antibodies, and various drugs. Environmental samples, forensic samples, large numbers of samples from field settings (animal farm house, military installation sampling), are all well suited for TruStrip STS technology for collection and storage of samples for future analyses. How does one know if a TruStrip™ strip has already been used for collecting sample or be assured of the recovery of sample from the strip? TruStrip™ system is a smart, sample collection technology. TruStrip™ strip sample pads are embedded with a non-reactive, colored (pink), sample tracking dye that can be seen as a line on the sample pad. The tracking dye will diffuse when samples, particularly colorless samples, are applied to the pad, thereby indicating that the strip has been used or has come into contact with some liquid. The diffused dye will recover along with the colorless sample present on the pad, creating a colored solution, leaving a clear-looking sample pad. Therefore, the tracking dye serves as a “sample-on and sample-off” visual indicator. It is even possible to measure the dye spectrophotometrically and quantify the recovery efficiency based upon the know amount and concentration of the dye that is initially applied to the pad. What is the temperature stability and the corresponding recovery efficiencies of samples stored on TruStrip™ strips? Whole blood, serum, plasma, purified proteins, antibodies, enzymes, and DNA (purified or plasmid) have been quantitatively recovered (95-105%) after storage at –80°C, -20°C, 4°C, room temp (25-28°C), 37°C for months or 45°C for 2 weeks. Total proteins assays, DNA tests or enzyme tested were used to demonstrate and quantify recovery efficiencies. Can the samples dried on TruStrip™ strip “come-off” or dislodge during shipping? TruStrip™ strips consist of specially designed active pad that has inert woven or micro pores (micron size). Liquid samples, upon drying, gets trapped within the pores and will not dislodge without the recovery process (solution or buffer). TruStrip™ strips that were tested in an orbital tumbler for one week showed the same sample recovery efficiency as the ones stored at room temperature or 4oC. Therefore, the samples stored on TruStrip™ strips will not dislodge or be lost during shipping. What is known about the biological activity of samples recovered from TruStrip™ strips? ADI has tested not only the physical recovery (mg or g of proteins, DNA, antibodies, or enzymes), but also the biological activity of samples. Human or animal blood or serum or plasma known to contain antibodies (Hepatitis, Ebola or MERS) stored and recovered from TruStrip strips has been shown by specific ELISA to retain the biological activity. The testing of almost all infectious animal and human sample requires that sample be tested at 1:50-1:500 dilution of the samples. Therefore, it is imperative that “defined volume” of samples is collected to in order to dilute the samples appropriately prior to testing. 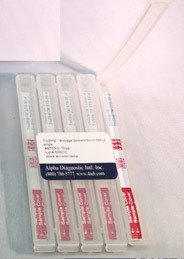 TruStrip™ strips are especially well suited for testing the presence or absence of disease. The ability to detect antibodies in whole blood makes the TruStrip™ system even more attractive for disease testing as it requires no sample processing to separate blood into serum or plasma or use any such additives (EDTA, Heparin, Citrate etc.). Enzymes (Peroxidase and Alkaline phosphatase) were used to test the recovery of enzymatic activity in samples recovered from TruStrip™ strips (94-105%). Expression plasmid DNA was loaded and recovered weeks after being loaded onto TruStrip™ strips. The recovered DNA retained complete structural integrity and biological activity, as ascertained by ability to transform competent bacteria. Therefore, TruStrip™ system can be used to store and transport plasmid DNA more efficiently and economically. Are TruStrip™ strips sterile? Do they contain any additives? TruStrip™ strips are produced in a clean, GLP environment and have no source of microbial or viral contamination. However, the TruStrip™ strips are not sterile. They contain no additives or preservatives. TruStrip™ strips used to collect samples and will retain the additives already present in the samples. Any additives present in the sample should recover with the samples. What are the US DOT (Dept. of Transportation) regulations for transporting TruStrip™ strips? Dried Blood Spot (DBS) technology has been in use for decades for the assessment of the health status of human neonates for congenital defects such as phenylketonuria. DBS sampling has distinct advantages for field testing, for ease of storage and shipping, is amenable for use on patients with large and small blood sample volumes such small birds, small animals, reptiles and amphibians. 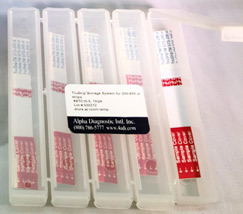 Air-dried blood specimens can be shipped by mail or other carrier with no reasonable expectations of occupational exposure to blood or other potentially infectious material. Federal Register, 39 CFR part 111 New Mailing Standards for Division 6.2 Infectious Substances. 2006; Section 10.17.9(b); Federal Register. 49 CFR part 173 Shippers General Requirements for Shipments and packaging. 2013; Section 173.134(b). Occupational Health and Safety Administration (OHSA). 29 CFR 1910.1030(g)(1)(i) Occupational Safety and Health Standards, Blood borne pathogens. United States Postal Service (USPS). 346 Toxic Substances and Infectious Substances (Hazard Class 6). 346.234, Nonregulated Materials. International Civil Aviation Organization (ICAO). International Civil Aviation Organization Technical Instructions for the Safe Transport of Dangerous Goods by Air, 2013-2014. United States Postal Service (USPS). Publication 52. Hazardous Restricted and Perishable Mail. USPS Packaging Instruction 6G. Nonregulated Infectious Materials, May 2014. Clinical and Laboratory Standards Institute (CLSI). 2013. Blood Collection on Filter Paper for Newborn Screening Programs; Approved Standard—Sixth Edition. CLSI document NBS01-A6. Clinical and Laboratory Standards Institute, Wayne, PA USA. Note : The above guidelines for references purpose only and not meant to be authoritative. ADI suggest that users consult respective agencies in their own countries for regulations regarding specific samples. Is there a TruStrip™ STS product informational video?